Archive for category: Tales of Toadstools / The inedibles! You are here: Home / Mushroom Diary Blog / Tales of Toadstools / The inedibles! 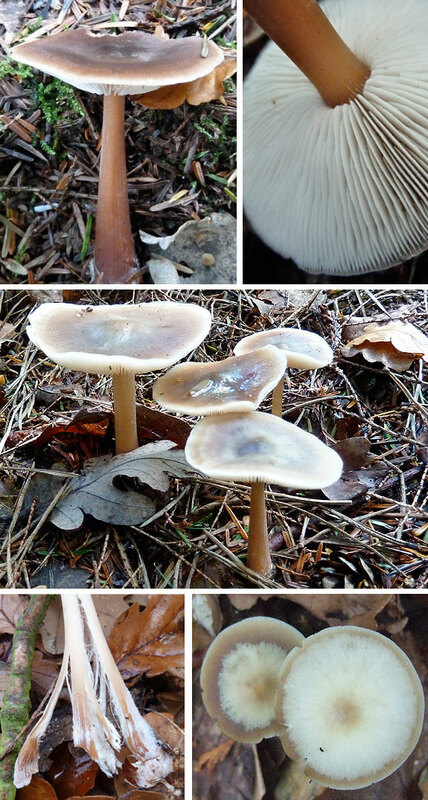 A collection of Toadstool discoveries, in grass, woods and forests. Includes the inedible and poisonous mushrooms. Apart from the usual (and culinary preferable) spring mushrooms out there such as the Morels and St.Georges Mushroom, there is still one pretty common woodland mushroom you may come across. The small and beautifully formed Winter Polypore (Polyporus brumalis) is quite a common winter/spring mushroom which is actually one of the smaller polypores to discover in woods. 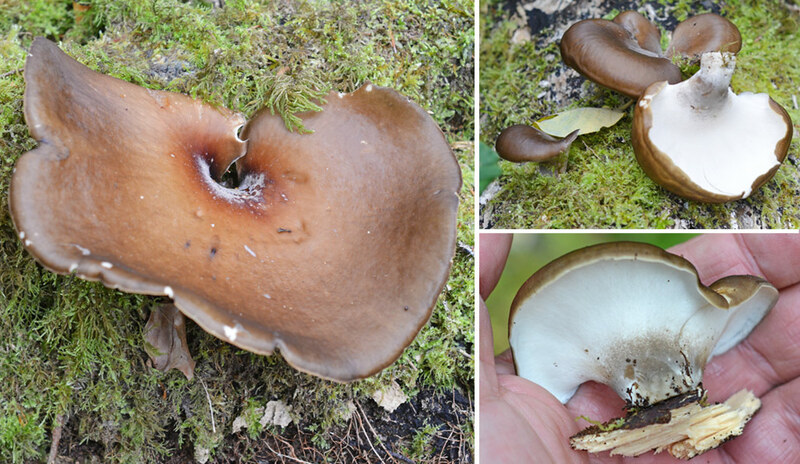 Polypore literally means ‘many pores’ due to the holes showing on the underside of the cap. These are the open ends of decurrent tubes growing downwards from the underside of the cap. 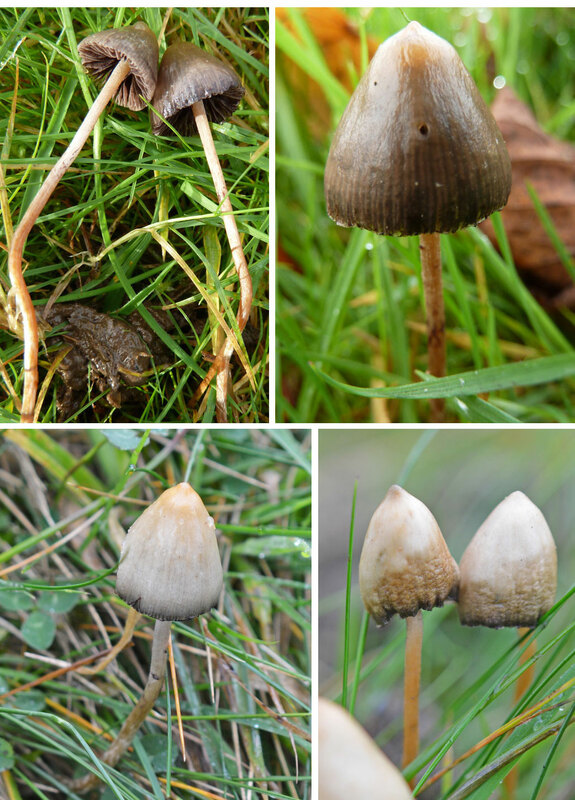 All members of this genus come in a variety of shapes, colours and sizes, but they consistently feature the typical cap and stem morphology of a regular mushroom with gills. The common name is quite relevant, as this mushroom has an uncommon fruiting season that typically begins at the end of autumn continuing through to the end of spring. Not many mushrooms last through this seasonal time span. I often find these mushrooms in small groups on large dead beech branches in early to mid spring. I venture out less in winter so I suspect that’s why I don’t see them often during this time! The cap flesh is very thin and the surface is nice and smooth. It has an average cap size of around 2-8cm. Its shape is initially convex but matures flatter and appears in various shades of tawny/brown. You may often see concentric zones of light and dark brown on the surface too. The images here show some slightly older examples. They become much more tough and leathery with age, and the cap edge becomes darker. The relatively large roundish/rectangular pores are initially white, but these too discolour to yellowish-brown over time. They are very widespread and pretty common, so keep a look out for them this spring. Enjoy. Fruiting bodies of Polyporus brumalis live on through the winter and spring seasons. 2-8 cm across. Variable shades of brown sometimes with concentric light & dark bands. Smooth texture, thin flesh. Up to 7cm long. Similar colour to cap. Cylindrical shape, sometimes off centre attachment. White when young. Turning tan with age. Roundish or sausage shaped (rectangular). On dead hardwood, esp. beech branches. Late autumn through to late spring. Inedible. Too tough. Little flesh. • Usually tough or hard and woody. 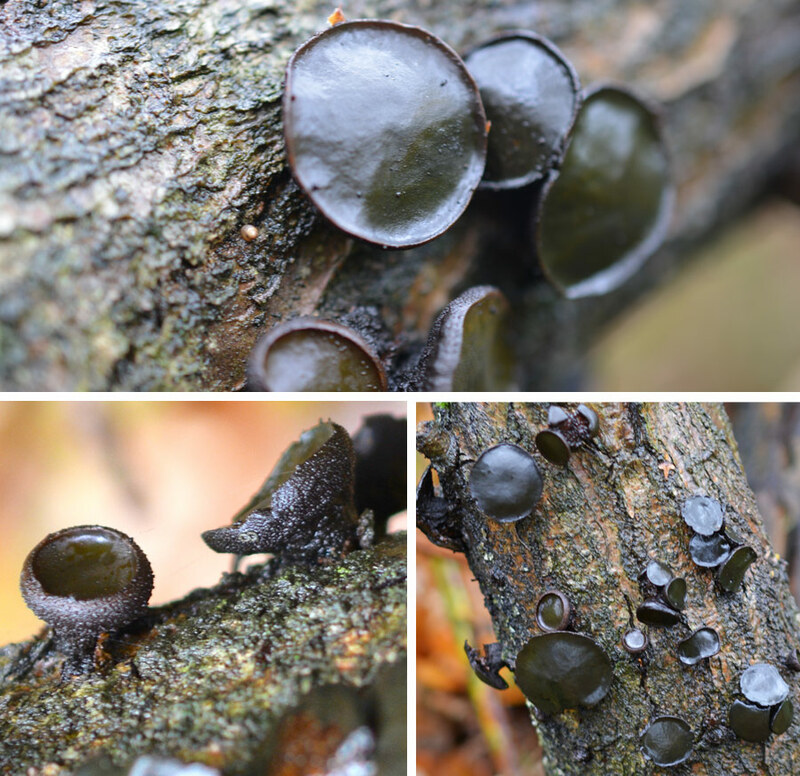 The Candle snuff Fungus (Xylaria hypoxylon) is one of these common and intriguing specimens. This member of the ‘flask’ fungi goes by several other common names, such as Stag’s Horn Fungus and Candlestick Fungus. I tend to avoid using the ‘Stag’s Horn’ name as it can cause confusion with the Common Yellow Staghorn, which is a completely different genus. Widespread throughout the year and covering most of the UK, mainland Europe and North America, it often appears in clustered groups on dead/decaying wood such as deciduous stumps and branches (sometimes pine) and also causing root rot in hawthorn and gooseberry plants. 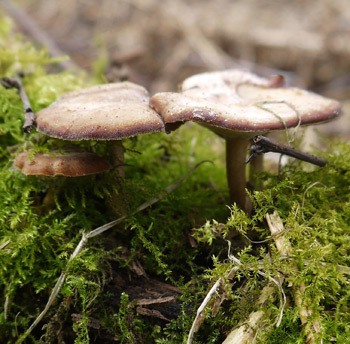 It tends to follow on from other ‘wood rotter’ species that were previous residents of the substrate, such as the larger Honey Fungus and Sulphur Tuft mushrooms. In late autumn and the winter months it is particularly more noticeable due to their white powdered tips. 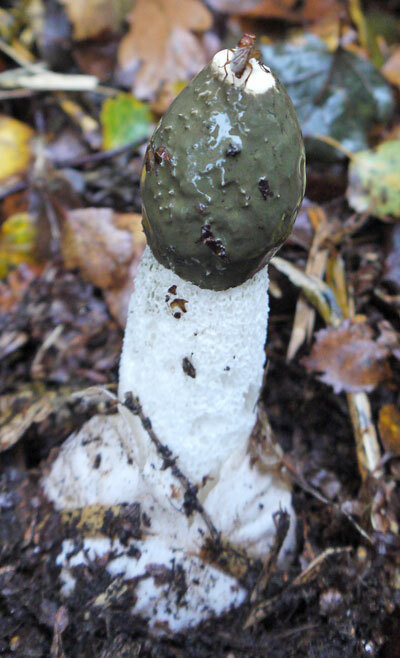 The young grey-white fruiting body initially appears as a small prong or spike growing out of the wood, standing between 2-5cm tall (up to 0.8cm in diametre). Over time it becomes flattened and twisted, developing several ‘antler like’ appendages. The base is black and finely downy. Eventually in spring, the whole fungus becomes black as the inner sexual spore-bearing cells mature. I don’t want to get too scientific about it, but it’s just to let you know when and what changes occur throughout its life. The mysterious ‘Candlesnuff’ name may be due to the fact that this is actually a bioluminescent fungus. The phosphorus contained in the mycelium reacts with oxygen and other chemicals in the fungus to produce a continual glow – just like the glow from a candle wick once extinguished maybe? Well that’s my theory anyway! But alas, this reaction is very weak and can only be seen in complete darkness with zero light pollution and a long photo exposure or using specialist imaging equipment. Never mind! Keep an eye for them over the winter months – they are often in massed in glorious photogenic groups. It would be rude not to take a picture! 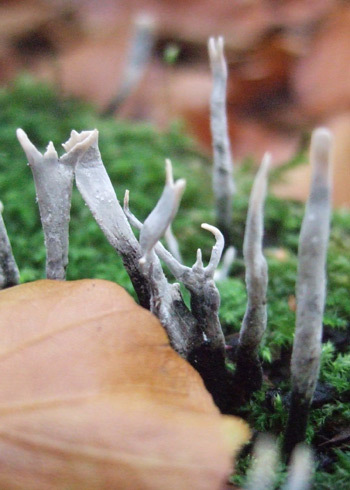 The powdery white tips of the Candlesnuff Fungus are most prominent in late autumn and winter. This coating disappears to leave the antlers black as it matures in spring (bottom left image). Initially short and prong like, growing into antler like formations covered in fine white powder. On dead/decaying stumps and branches. All year. Mature & black in spring. Hope you all have a great Christmas and new year. I was going to squeeze this post in just before 2015 began, but I was too busy drinking! 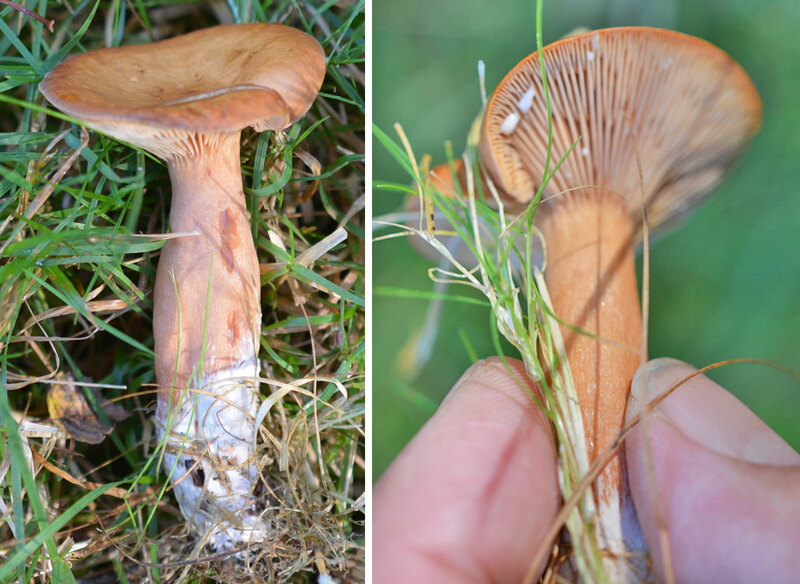 This autumn mushroom had clung on right until Christmas Day – although the examples I discovered were past their prime, I’m showing some images of these mushrooms I found earlier in the season. Aptly named for a Christmas time find, The Angel’s Bonnet (Mycena arcangeliana) is an attractive and perfectly formed example of a typical Mycena (or Bonnet) mushroom; broadly conical with a long delicate and slender stem. Having the angelic name (which may be in honour to the botanist Giovanni Arcangeli) you’d be forgiven for thinking that this would be a pure white species, but in fact its ‘whitish’ translucent and striated cap has subtle grey-brown hues, especially at the centre. There may also be tinges of yellow or olive colours too. 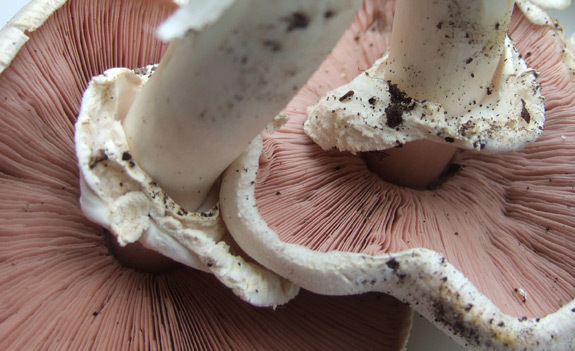 The gills are initially white and turn pinkish over time, but the spore print is white, or whitish. 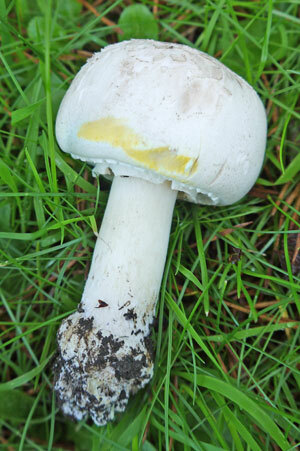 The fragile stem is pale at the apex but is essentially greyish, becoming darker further down, especially at the base which is covered in a fine white down. Take time also to have a quick sniff of this mushroom. It has a distinctive smell of iodoform – or that ‘hospital smell’ as I call it. You may need to crush the cap flesh to get a real good whiff! It grows in typical ‘lined’ group formations on stumps and branches of deciduous trees and are very attractive when in full bloom (so to speak). The examples in the photos here are spread across a fallen branch. They are very common and widespread throughout the autumn months, but this Mycena is also known as the ‘Late-Season Bonnet’ which is probably why it appeared on this mild winter day. A nice find I thought. Anyway, keep your eye out for the usual winter suspects, especially the Wood Blewits and Velvet Shanks which (unlike our Bonnet mushroom here) are edible and tasty. 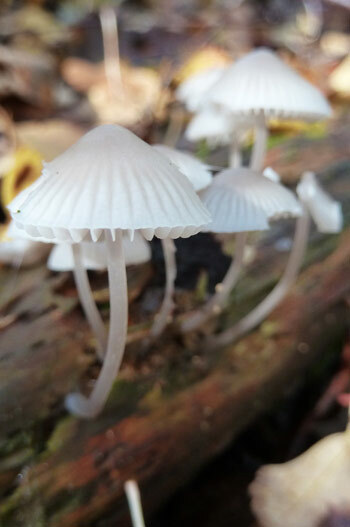 Mycena arcangeliana. Typically growing in rows on deciduous stumps and branches. 1-5cm across. Broad conical shape. White with a grey-brown hue and sometimes olive (or yellowish) tints. Striate markings with white margin. Iodoform smell. 2-4cm x 0.1-0.2cm. Whitish grey. Darker at base which is covered with white down. Adnex and crowded. Initially white the turning pinkish. Spore Print: Whitish (see how to take a spore print here). Typically in rows on deciduous stumps, logs and branches. Mainly autumn. Very common. • Often cap edge is striated. Most bracket fungi are usually every day ‘all year round’ kind of guys, some persisting even for years. And here’s one of the other common shelf fungi to perpetuate throughout the year, releasing it’s reproductive spores (sporulating) during spring. It can be large, lumpy, but unfortunately inedible which is a shame due to the potential size it can reach. 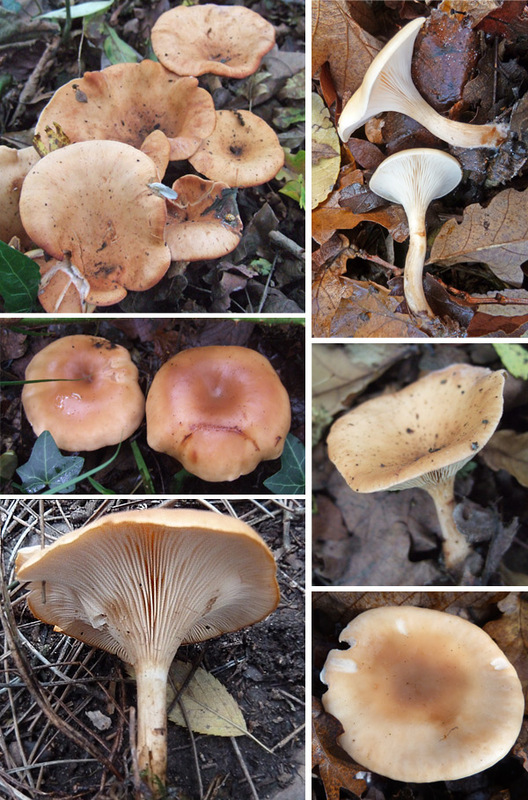 The Lumpy Bracket (Trametes gibbosa) is found in woodland exclusively growing on dead deciduous wood, of which it favours beech, often solitary but also can be found in medium to large groups (sometimes very large groups – see photographs below). Either way, most of the time it is a striking white colour (sometimes with hues of grey or buff) and very thick and lumpy. 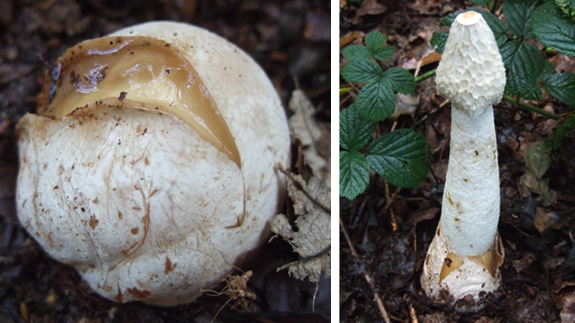 One fruiting body can grow up to 20 cm across and up to 7 or 8 cm thick. It’s typical semicircular shape often displays a distinctive central hump at the back where it meets the wood, especially when larger. The attachment to the wood is very thick and sturdy. Its surface texture is initially velvet-like due to very fine surface hairs and later, with age, it becomes smooth to the touch. A key characteristic I always look out for in order to confirm identification for sure, especially while out in the filed, is that the margin (edge of the bracket) is noticeably thick (like an outer ‘lip’ – especially when younger), although it does become thinner with age. It sometimes is a darker shade to the rest of the fungus, but this may be due to environmental conditions etc. And talking of that, you may stumble across many examples that appear green! This is because they are key targets for algae that like to grow among the fine downy hairs on the surface. 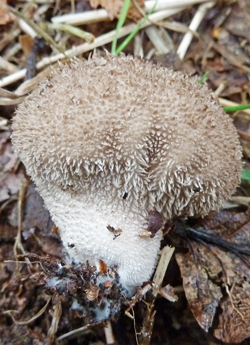 The pores on the underside are distinctively elongated and quite large. They are initially white or grey-white and age to a creamy colour. In large groups (especially when younger) as illustrated in the photograph below, they can appear in stunning floral-like arrangements. I had to double check these were Lumpy Brackets as it’s not a typical site to see. But they were indeed worth a photograph or two. So keep a look out for these beauties, and as I commented on earlier, it’s a shame they’re not edible. 5-20cm across. Semicircular shape. 1-8cm thick. White, usually buff hues or with green algae markings. Minutely downy, later smooth. On dead deciduous wood, usually beech. All year. Sporulating in spring. Not edible. Too tough. Bitter and tasteless. This is another perennial bracket fungus that is extremely common. If you find them at the right time in their life-cycle you’ll be witness to some beautiful displays that are visually stunning. What we have here is Turkeytail (trametes-versicolor) and is often layered in tiered groups on deciduous wood all year round. I often find these in ‘full bloom’ (so to speak) during the summer months. The pictures shown here are a selection from last June. The common English name is very apt due to distinctive fan-like shape and concentric mix of colours involved, very similar indeed to that of a Turkeys’ tail feathers. You learn something new everyday! The ‘versicolor’ description in the scientific name explains the changeable range of colours in which they can be found, such as shades of brown, blues, greys and greens. But whatever variable colour set you find, the thin wavy edge always remains creamy white. There are other Trametes species that do not share this feature. The upper surface to touch is often variable too, depending on the weather conditions and age of the specimen. When younger, the texture is like a soft velvet, but this becomes smoother and less velvety with age. The creamy white underside as you’ve probably guessed consists of many tiny round pores, with a few that are angular here and there. The flesh too is white with a tough and leathery consistency. Not really an edible species. It has no real taste to speak of anyway. Never mind. But keep a look out for Turkeytail this autumn. I hope you get lucky and see some great examples of this pretty bracket. Notice the varied mix of colours shown here of the common bracket fungus Turkeytail – Trametes versicolor. The margin is always cream/white and and nearly always thin and wavy. 4-10cm x 3-5cm. 0.1-0.5cm thickness. Often in large tiered groups, overlapping each other. Upper surface extremely variable in mixed colours. Concentric pattern. White wavy edge. White / Smooth. Matures to ochre. Small and circular often with irregular, angular pores too. All year round. Growing on deciduous wood. Very common. It only seems logical that my next post is of yet another Earthball, just as a good comparison to my previous post on the Common Earthball. 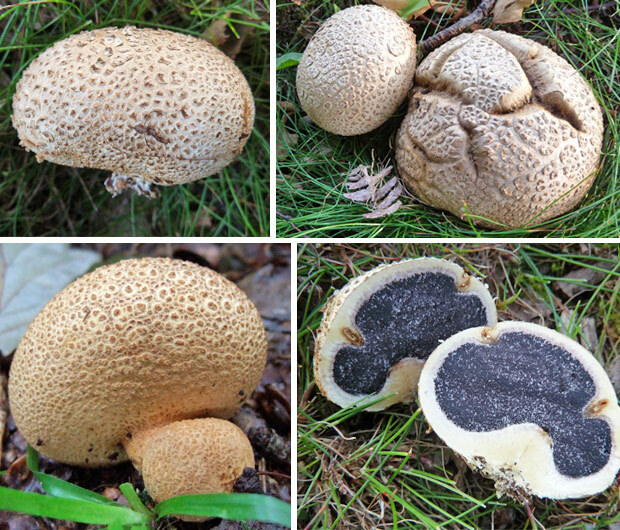 The Scaly Earthball (Scleroderma verrucosum) is similar to Common Earthball (see post here), but more often confused with the Leopard Earthball (post and pics to come soon I hope). This is understandable as they both share the same thick long tapering ‘stem like’ protusion and elliptical shape with brown dotted scales on the surface. The dark brown scales on the Scaly Earthball are often random-like in their pattern whereas the Leopard Earthball has a network-like collection of brown scales surrounded by a ring (which eventually where off). You have to have a good look. The Leopard Earthball is also typically smaller, usually only growing as big as 4cm across. The outer wall (again like the Leopard Earthball) is very thin compared to the Common Earthball. Taking one in hand and gently squeezing it will easily deform the shape. When mature, this outer skin will split irregularly near the top to release the powdery spores. Give it a little tap to see the puff cloud. Great fun, but don’t eat them! 2-8cm in diametre. Spherical / Sometimes flattish on top. Brown with darker scales. Outer wall thin. Opens irregularly near apex. Uncharacteristically long & thick white ‘stem-like’ protusion at base. Woods, heaths and verges in rich sandy soil. Late summer to autumn. Common. 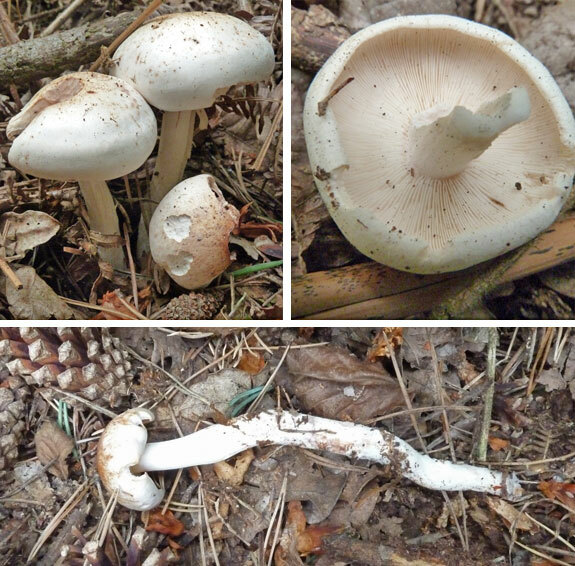 I love to feature all the lovely wild edible mushrooms I find (when I get the precious time), but every so often I have to include those annoying ‘look-a-likes’ so that we can all be aware of and be prepared for such party poopers! The False Chanterelle (Hygrophoropsis aurantiaca) is a very common and strikingly colourful mushroom, predominantly found in small to large groups, mainly in coniferous woodland. They can also be found on heathland too. Although this mushroom is mainly an autumn species, I have often found it during late summer (just like the true Chanterelle) around early August, hence the reason I’m featuring it now at the end of July. Myself and many other people have made the same mistake in thinking their luck was in – “Chanterelles – Fantastic”. Oh, how wrong we were. The Chanterelle (Chantharellus cibarius) has the same fruiting season (including late summer), habitat (as well as deciduous woods) and general size and appearance. 1. The Colour: The False Chanterelle tends to be a deeper Orange-Yellow compared to lighter egg yoke yellow of the True Chanterelle. 2. The Cap: The False Chanterelle has a fine ‘downy’ surface texture (esp. when younger). 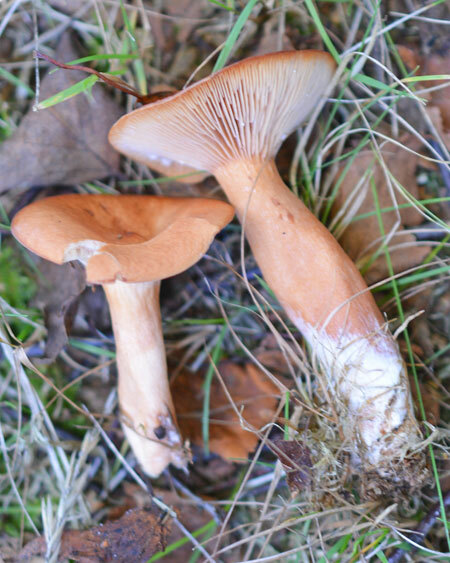 The True Chanterelle has a more distinctive ‘irregular’ wavy and lobed shape all round the edge. 3. The Gills: Although they both extend down the stem, The True Chanterelle has ‘false’ gills which are thicker and more fleshy. 4. The Smell: The False Chanterelle has a ‘mushroomy’ smell while the True Chanterelle has a very distinctive fruity, apricot-like odour. 3. Spore Print: To double check, you can take a spore print – False Chanterelle = white / True Chanterelle = Yellow/ochre. Unfortunately, I don’t currently have any (True) Chanterelle images to show in comparison. I will add when I can at a later date of course. The False Chanterelle has been known to be edible just like the True Chanterelle, but obviously not as superior in flavour etc. Some reference books have labelled it as harmless, but even though it isn’t deadly there have been reports from some people suffering unpleasant or alarming hallucinations. So I would recommend that nobody eat this mushroom. And to finish, by adding confusion to the confusion, there’s are ‘look-a-like’ to this ‘look-a-like’ which I think most people in Southern Europe should be concerned about. 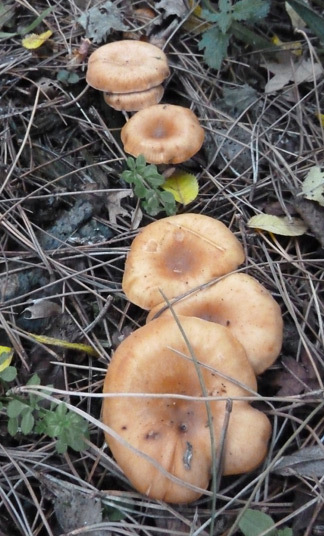 The Jack o’ Lantern Mushroom (Omphalotus olearius) has patchy distribution throughout Southern Europe (with rare sightings in UK and Northern Europe). Again, it looks very similar to the True and False Chanterelles but is definitely posionous. Have no fear though, these guys usually grow in tight groups on living or dead wood of deciduous trees (from the underground roots) so that rules out the others and the major feature the Jack o’ Lantern has is that it’s (mature) gills have an amazing phosphorescent property and glow very bright green in the dark. This I know only from research and I would love to find some and see the effect in action. So that’s a good excuse for a holiday in Southern Europe then aye!? Keep your eyes out this Late summer/autumn time and I hope your Chanterelle hunting moments don’t get ruined by this naughty twin. 2 -8 cm diametrre. Convex to funnel shaped. Often inrolled at the edge (margin). Orange-Yellow. 3 – 5 cm x 0.5 – 1cm. Often curved. Same colour or darker than cap. Decurrent, forked. Orange, thin and crowded. Coniferous woods, heaths. Very common. Late summer – autumn. Said to be edible but reports of hallucinations recorded. I have come across the Hare’s Foot Inkcap (Coprinopsis lagopus / Coprinus lagopus) as early as May right through to the late autumn months. It gets its common English name from the way the young ‘furry-like’ fruiting body is reminiscent of a hare’s foot – albeit poking up from the ground (hence my tasteless post title). 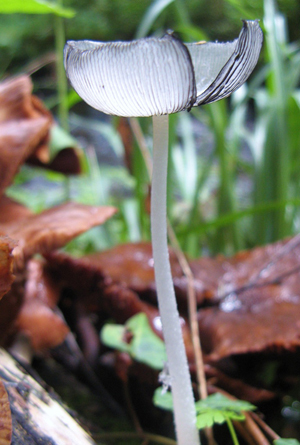 This Inkcap mushroom is usually found in small groups and matures into relatively tall specimens (up to 12 or 13cm in some cases). 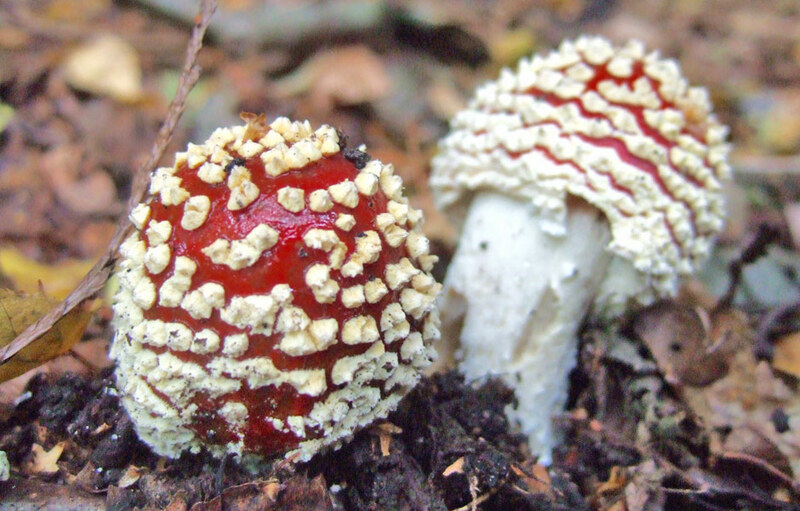 They’re usually found on soil or leaf litter in woodland (sometimes in rarer field scenarios). But quite often, as in this case, they especially seem to enjoy taking to wherever there has been man made disturbance in woodland. There had been a huge pile of woodchip/bark mulch, left by the recent activity of forestry workers. There were dozens of them, in several groups spread across one side of the large mound. 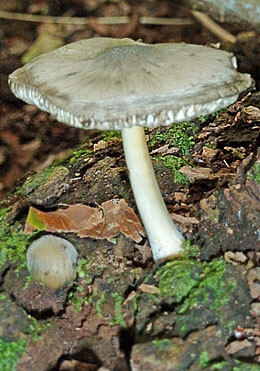 The white(ish) veil remnants are numerous on the young caps, which are very delicate and disappear on handling. The cap expands to almost flat, thinly spreading out the fine fibres on it’s greyish and finely grooved surface. 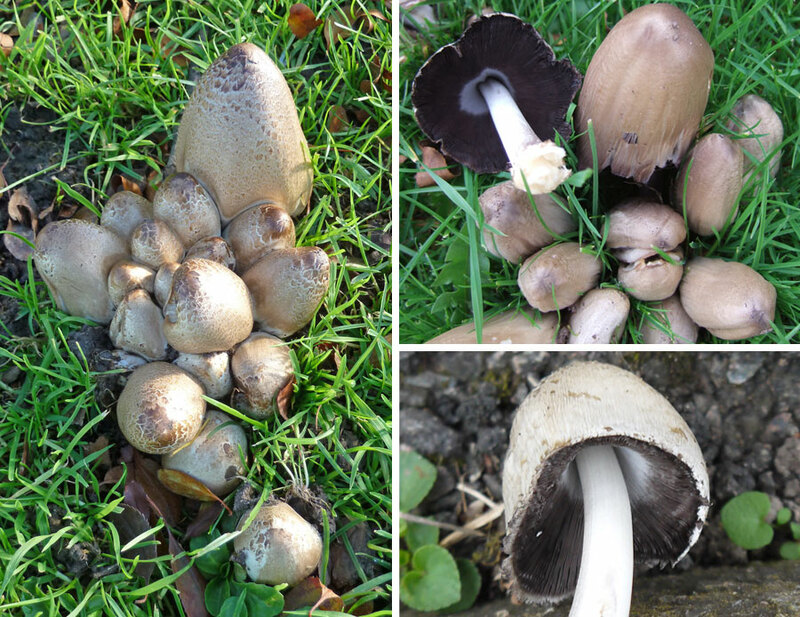 During this ‘growing’ stage, the young white gills soon turn black and deliquesce (turning to inky fluid) typical of nearly all the Inkcaps. The long white stem is also covered in fine white fibrous scales but usually end up becoming completely smooth. If you do find some of these Inkcaps coming to the end of their life, you’ll notice the cap curls upwards as it decays. And if you pick and hold up the mushroom to the sky (gills towards you) you will also see it is very translucent due to the very thin flesh. All interesting stuff. Anyway, they’re pretty common throughout the UK and unfortunately inedible as they’re not really worth the time. Never mind eh!? Young: 2-4 cm high, conical or ovate, covered in fine downy white veil remnants. Mature: Up to 6cm diametre, thin, grey. Covered in whitish veil remnants. 6-13 cm x 0.3-0.5cm. White, swollen at base. Covered in fine white down. Smooth later. White, turning black very soon and deliquescing. Spore Print: Violaceous black (see how to take a spore print here). In groups on soil or leaf litter in woodland (less so in fields). Commonly found in disturbed woodland areas on wood chip or mulch. Early summer to late autumn. 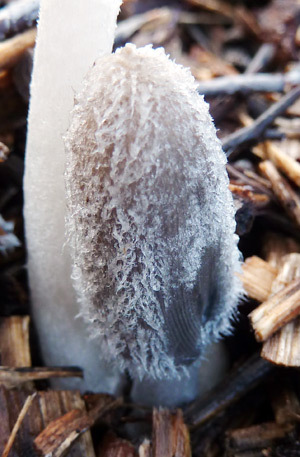 This great picture of an older Coprinus lagopus was kindly supplied by Mark Williams at www.gallowaywildfoods.com – Notice the up curling edges and see how much of the dark inky fluid, containing the spores, has dissipated, leaving a lighter, translucent cap. It’s early June and with the recent inclement weather (or great weather for mushroom hunters!) there are plenty of different species popping up here and there. But after a local visit to a local (mixed woodland) wood, I was quite disappointed with the results. But then again, summer is usually a good mix of grassland and woodland finds. You can’t win or find them all! After seeing these chaps again, I felt it was time to feature this common woodland mushroom (which I always see this time of year). As usual, they’ll be hugging the base of an oak, beech or other deciduous tree or stump. Yes, the Toughshank / Spindle-shank (Collybia fusipes (Gymnopus fusipes)) has always been a reliable show around summer all the way through to early winter time. It can also show it’s face during the late spring months too. 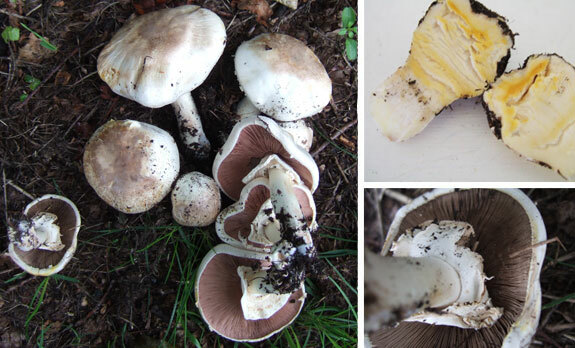 Collybia (or Gymnopus) species* have the common English name of ‘Toughshanks’ for the simple reason that they have very tough, flexible and fibrous stems. In addition to this (or subtraction!) they never have any ring or volva present (see mushroom identification page for more general info). As mentioned, they often appear at the base of broadleaved trees (especially oak) and grow in dense tufts of a dozen or more. Sometimes they can appear to be growing out of the ground, but they are in fact attached to the nearby host tree via it’s underground roots. I have only seen this a few times and I really don’t know how common that is. When young, the numerous caps appear button like (between 1 – 3 cm in diametre) and are red/brown in colour with lighter patches here and there. You’ll also notice much darker spots on the surface due to the odd nibble from a bug or minor surface imperfection. When more mature, the cap expands up to 7cm in diametre and fades slightly in colour (see pictures below) especially as it drys out. The texture is very smooth but gooey when moist, or soon after rain. But the main identification feature of this mushroom (or should I say mushroom group) is that the stem, as we already know, is very fibrous and tough. Just break it apart and you’ll see. It is more ‘swollen’ in the centre where the colour deepens and grows darker brown towards the thinning, tapered base. These stems often fuse together as one. Indeed, this is a common trait in many of the Toughshanks. The gills are free but may also be attached to the stem ‘decurrently’ only very slightly (see gill attachment details). They are whitish in colour then show a reddish tinge later on. 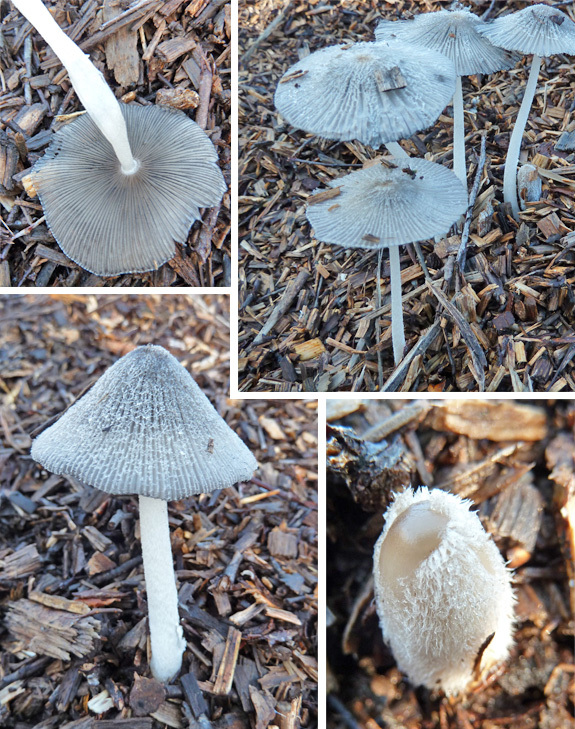 Note the younger/smaller examples (top right & bottom middle) and the paler/dryer mushroom group (top left/bottom middle). These were all found at the base of oak trees in mixed woodland. 2-7 cm in diametre. Dark red/brown. Dome shaped expanding with age. Paler when dry. 4-9cm x 0.7-1.5cm. Thicker in middle. Thin and darker at base. Often fused with others. In dense tufts at the base of deciduous trees, mainly oak and beech. Late spring to winter. Inedible. Too tough and stringy. • No ring or volva present. • Gills often crowded / never decurrent. Sorry for the awful title, but it had to be done! I can’t believe I haven’t made a post on this mushroom before either. Next to the Brown Roll Rim, this has had to have been the most common mushroom I’ve found in great number during autumn/early winter last year (2011). Often found in woodland in large scattered groups or even as solitary souls, the Butter Cap (Collybia butyracea / Rhodocollybia butyracea*) is a very common edible mushroom (hence being categorised in my ‘Woodland Treats’ blog category) but does not have a particularly pleasurable texture or amazing taste (so I’ve put it in ‘Tales of Toadstools / The Inedibles’ category too). 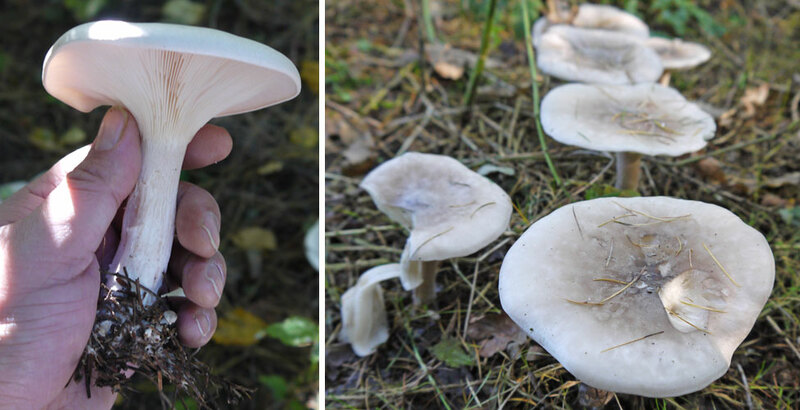 The texture of the cap, as the common English name suggests, is very smooth, slippery and greasy – not unlike the sensation when you run your finger on some butter… As you do! The unreliable cap colour can range from dark red/brown, ocherous/buff brown to pale bone-white or ivory (usually with a much darker centre) when older and dryer. Also adding to the confusion is that this species has a common ‘lighter’ variation (Collybia butyracea var. asema) which (I think) is currently under debate. It is generally lighter all round in colour, and I’m making an educated guess that the centre picture below is a good example of this variant. The shape of the cap and the gills are fortunately more reliable, usually with a shallow dome shape and distinctive raised bump at the centre (or umbo). 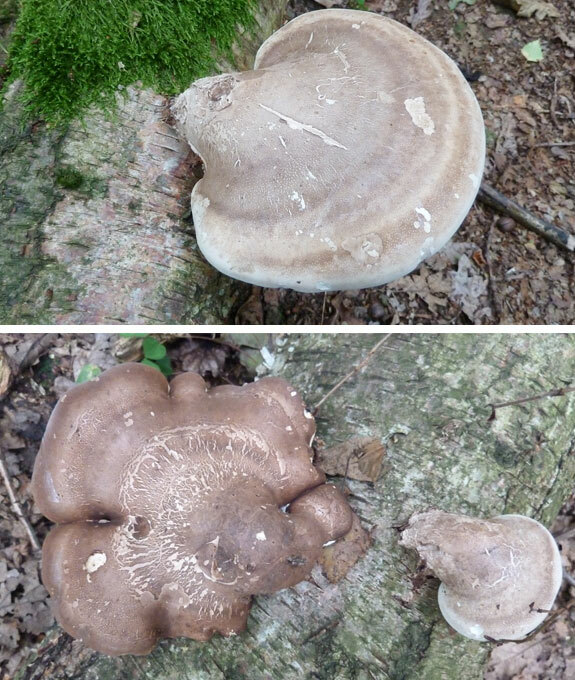 Sizes in width can differ from small to medium-large (3 – 8cm) and the margin (edge) is lighter than the rest of the cap, sometimes becoming irregular and even ‘wavy’, often showing a faint striated edge (see Mushroom Identifaction Page for more info on Margin/Edge ID features). The gills are crowded, free from the stem and remain white(ish). But for best identification I always examine the stem. It shares the same brown shade shown on the cap and typically has a slightly thicker base compared to the thin tapering at the apex where it joins the cap. It becomes hollow towards the base which is darker, often covered in fine white down. A little test to confirm identification is to break apart the stem. It is very tough and stringy and you will see also where it is hollow at the base. You can take a quick ‘smell’ test, but again, I wouldn’t fully rely on this for a good ID tip. It can be very mildly mushroomy or even slighty rancid. So there you go! Note: As I mentioned earlier, this species is abundant in mixed Woodland throughout autumn to early winter, but while out on a recent foray that they can appear in grassland near woodland, but it doesn’t happen often. The small group I found in November 2011 were of the lighter variety, large and creakily shaped. Obviously they were going mad trying to get themselves back to the woods. Maybe! *Note: To date, some members of the Collybia family have been moved to new genera due to DNA research and some may have different names. 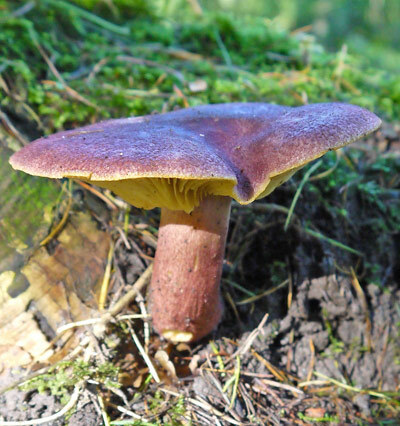 ‘Collybia butyracea’ still seems to be currently used here and there, but technically speaking it is ‘Rhodocollybia butyracea’. Butter Caps (Collybia butyracea var.asema) abundant in leaf litter in autumn through to early winter. Note the ‘broken apart’ stem base which is covered in fine white down (bottom-left). It is stringy, tough and hollow. 3-7cm accross. Initially convex; flattening out, developing distinctive central bump (umbo). pale ochre – reddish brown (dependent on what variety). Drying to reveal patches of ivory white. White flesh with mushroom smell. Greasy (buttery) to touch. 2.5-5cm x 0.5-1cm. Tough. Slightly bulbous at base. Similar colouring to cap. Becoming hollow. Base when broken is stringy and fibrous. Spore Print: White or very pale pink (see how to take a spore print here). Leaf litter in deciduous or coniferous woods. Autumn – early winter. It’s always a joy to find great big clumps of mushrooms while out foraging, especially when you’re not having much luck elsewhere. When you can’t find one mushroom – a bunch of them come along at the same time. Typical! Always found at the base of living trees, the Shaggy Scalycap (Pholiota squarossa) is usually found in large, visually striking groups. The first time I found a particularly large gathering of 20 or so together, I was hoping they were edible. In fact I was ‘wishing’ that they were! But in fact they’re just too bitter to be enjoyed which is a great shame considering their size and abundance in which they grow. The name Pholiota means ‘scaly’ in greek which is a very apt name for this particular genus, all of whom share the common trait of bearing scales on their cap and/or stem. But our common Shaggy Scalycap is one of the best examples at showing this feature off. The cap, which ranges in size from 3 to 12cm, is a particularly dull or straw-like yellow covered in thick brown ‘upturned’ scales, and it doesn’t stop there! The long stem is just the same, with the scales becoming finer and smaller towards the darkening base. 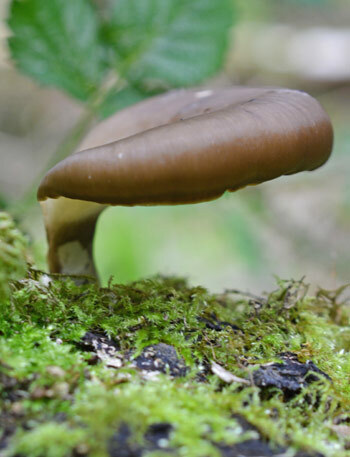 Apart from the crowded cinnamon brown gills (pale yellow when young) the only smooth area to be found is just above the torn ring zone – very close to where it meets the cap. Although fairly common in the UK mainly with deciduous trees, the Shaggy Scalycap is particularly common in the Rocky Mountains with aspen and spruce trees. So that adds up to great scenery with the bonus of impressive mushrooms. It’s all good. Other identification tips are in the ID chart below, but before you look there I thought I’d make a note about the poisonous Inocybe terrigena which can sometimes look familiar if you’re not used to the Shaggy Scalycap. But fortunately this not-so-common toadstool (one the ‘Fibrecaps’) grows on it’s own in chalky soils and not in dense clusters at the base of trees. Close up of the scaly cap and stem. Note the smooth area on the stem above the torn ring. 4-12cm across. Convex; sometimes bell-shaped. Inrolled margin. Pale yellow with coarse brown scales. 5-12cm x 1-1.5cm. Like cap in colour; darker brown at the base. Smooth texture above the ring. Subdecurrent and crowded. Initially yellow, maturing to cinammon. Spore Print: Rusty brown (see how to take a spore print here). At the base of deciduous trees in clumps. Occasionally with conifers. Autumn. • Grow on base of stumps and standing living or dead broad leaved trees, branches, wood debris. • Most form grouped clumps. • Spore print is rusty brown. This is one of my favourite mushrooms, not really for eating but mainly because of it’s attractive colours and fantastic commonly used name! 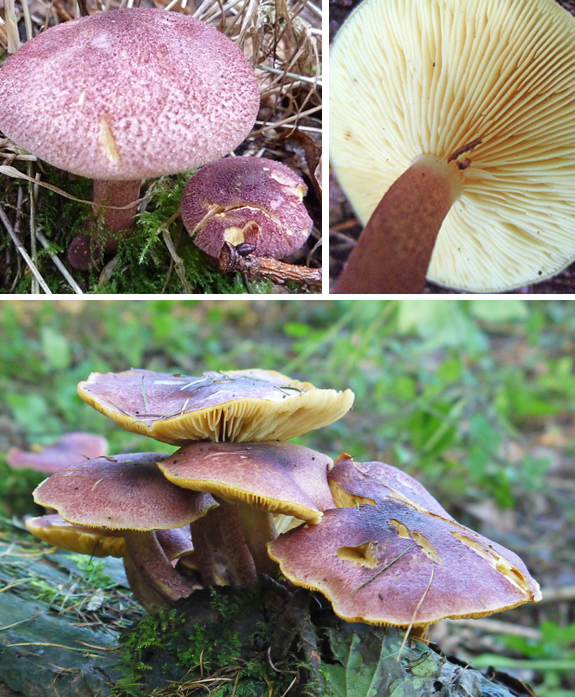 Simply called Plums and Custard (Tricholomopsis rutilans) this very common mushroom almost looks good enough to eat, and even sounds good enough to eat, but before you get too excited, the general consensus is that it’s just not recommended. Too watery, unappealing with a bitter or unpleasant taste. Mind you, I’m not really much a fan of the real dish! When you first stumble across this mushroom, the first thing you notice is it’s striking purple cap (sometimes with a reddish tinge). On closer inspection you’ll notice that purple effect is made up of many purple/reddish flecks or scales on a predominately yellow cap. They’re are usually denser at the centre, appearing darker. The same colour features on the stem are similar to the cap, but the fine purple scales are less profuse. On the underside you’ll find the distinctive rich yellow gills, which in my opinion, actually do have an uncanny hue of custard. 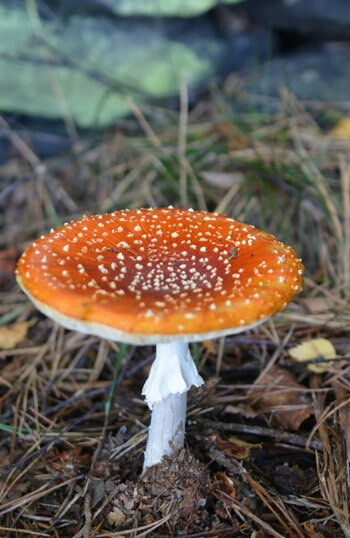 The size of this mushroom varies from place to place and can grow quite large. But basically the cap dimaetre ranges from as small as 4cm up to 12cm. I also read somewhere that one specimen at an Italian mushroom show had an unusually large cap of 56cm in diametre. Now that’s big! 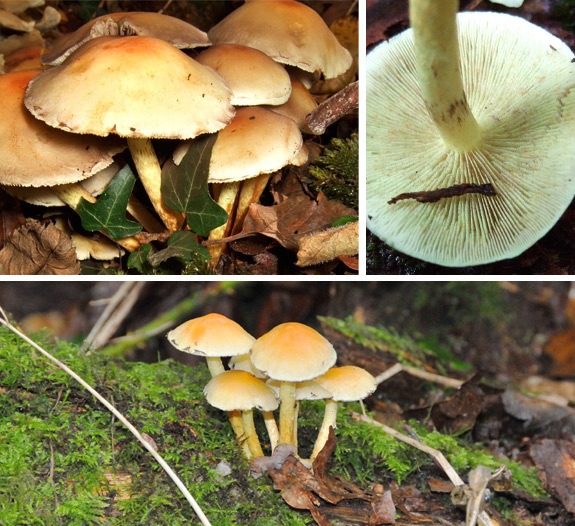 Next time you’re out in coniferous woodland during the usual mushroom season (September – November) keep a look out for these beauties growing on or around dead wood or old stumps. Shame we can’t actually eat them. Not for pleasure anyway! 4-12cm across. Convex; sometimes bell-shaped usually with a shallow/broad umbo. Yellow flesh covered covered with purple/reddish scaly flecks. 3.5-6cm x 1-1.5cm. Colour and covering like cap but not as dense. Adnate to adnexed. Custard yellow. In woodland on rotting coniferous wood and stumps. Late summer – late autumn. Edible but doesn’t taste good. I especially notice the puffballs first. I don’t know if this just a Leicestershire thing, but I always find them in abundance, on grass or in woodland, keen to get going. 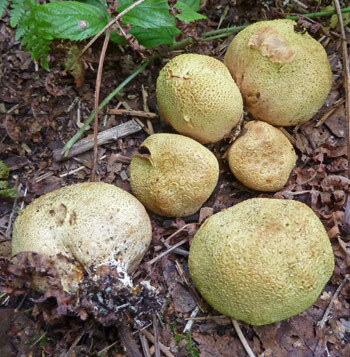 As I walked in the woods today I found at least three different types of woodland puffball without really having to look that hard. They really like to get started early! I chose to feature the Spiny Puffball (Lycoperdon echinatum) because I hadn’t taken pictures of it before. It’s a great looking and slightly unusual member of the puffball family. Often hidden from view, it blends in very well with the undergrowth (depending on their age). They start off white but soon turn to neutral brown colour, although the short stem can remain white for longer. It’s most noticeable feature of course is that it’s covered in many tiny spines or spikes. These are finer and less pyramidal than the Common Puffball and naturally a different colour. After time some of these spines can become detached from the main body, leaving a cellular-like pattern, usually before the puffball opens up at the top to disperse it’s spores. Unfortunately I have no current example in the photos shown here. Dimensions are also similar to the Common Puffball except for the shorter stem, and live in a similar environment. The Spiny Puffball prefers deciduous woods (and sometimes heaths) whereas the Common Puffball is in any type of woodland (deciduous or coniferous). The young inner flesh looks quite nice, but this puffball is unfortunately classed as inedible, and I don’t know why. Perhaps the taste is disagreeable and unpleasant. I really didn’t feel like trying. There’s plenty more edible mushrooms on the way. P.S. Also see – The Common Puffball and the Meadow Puffball. 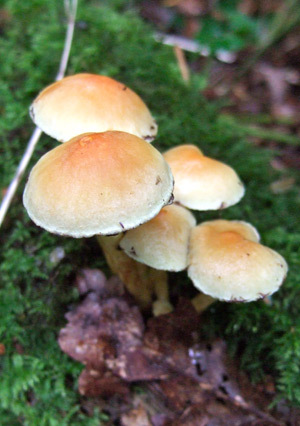 *In the US (Pennsylvania) a popular mushroom festival coincidentally started this year on my birthday! (http://www.mushroomfestival.org/). If you’re over near that way, it’s definitely worth a look. Although this is a very common species of mushroom, I don’t come across them that often. Even though mainly white in colour they always seem to be hiding under bracken or disguise themselves in similar woodland undergrowth. I found this lovely group of ‘toughshanks’ (common name) in some mixed woodland, near the edge of a grassy woodland path hiding in the undergrowth. They can be found in both deciduous and coniferous woodland but they tend to favour coniferous trees – like this group. 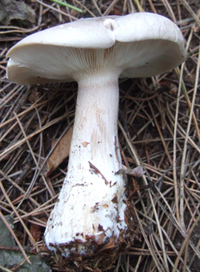 The caps are initially a clean with a (slightly creamy) white colour, but soon develop brown spots or freckles on the cap. These tan brown spots can sometimes merge or not be as contrasty against the white cap, so it may sometimes appear as one blended brown patch, especially at the centre. When younger the caps are dome shaped but flatten out with age and sometimes get wavy at the edges. 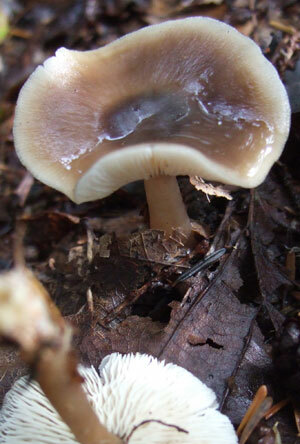 On the underside the crowded gills (free from the stem) are also white and, in a similar fashion to the cap, become spotted dark brown with age. The stem is also a great identification marker too. 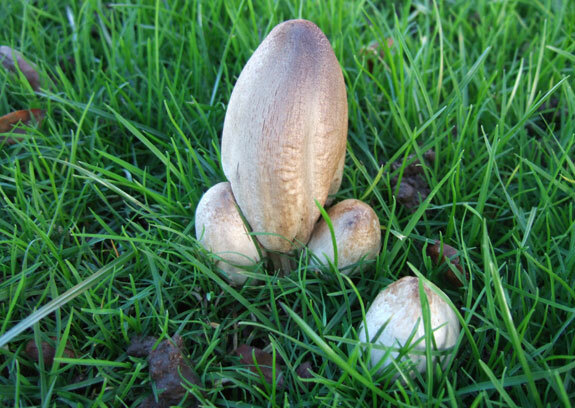 As with all Collybia species, the ‘shank’ is tough, fibrous and flexible. None of this genus have rings present either. 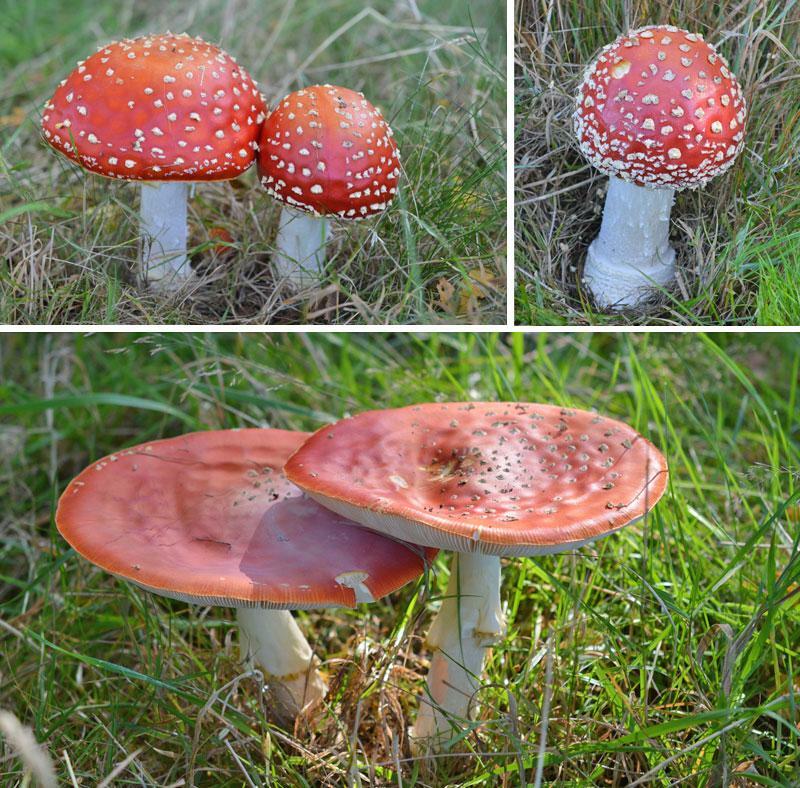 As you see in the pictures they can also grow quite tall (up to 12cm), markings are similar to the cap, but mainly white and the longer stems can sometimes be slightly routing. *Note: To date, some members of the Collybia family have been moved to new genera due to DNA research and some may have different names. ‘Collybia maculata’ still seems to be currently used here and there, but technically speaking it is ‘Rhodocollybia maculata’. See the speckles? 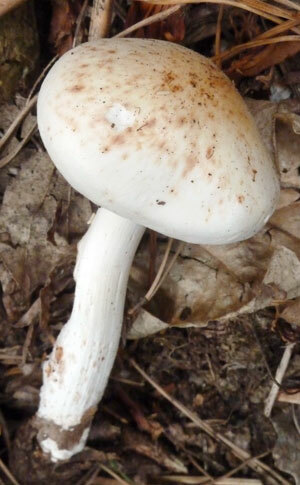 The typical brown spots on the white cap of the Spotted Toughshank. 3-10cm across. First domed then flattened slightly. Creamy white, developing brown spotted markings on the surface. 5-10cm x 0.7-1.5cm. Similar colour to cap. Sometimes ‘rooting’. Free, white and crowded. Brown spots appear with age. Spore Print: Cream to pale pink (see how to take a spore print here). In all woodland. In undergrowth or bracken on heath land. Summer – late autumn. I often hear from my friends various stories from their travels in these winter months. They sometimes stumble across ‘small and brown mushrooms’ – “What are they?” they would shout! Without really being there, that was really quite a tough question! 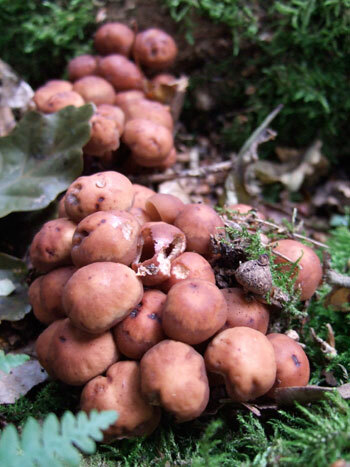 Small and brown mushrooms usually mean ‘nightmare identification’ to most people. But if it’s a winter mushroom (ie. January/February) I at least have the advantage of elimination. Apart from the Velevet Shank mushroom, there’s really not much out there this time of year. 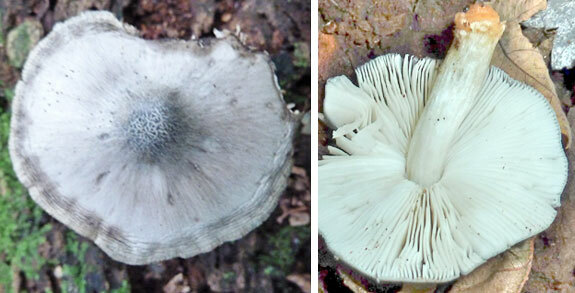 But there are still quite a few typical ‘mushroom-shaped’ species scattered around (ie. not a bracket fungus). And recently I myself have come across a certain small brown species, found in mid-january. 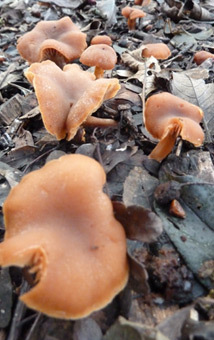 They were growing in abundance along the side of a grassy woodland path, among the dead leaves and general wood mulch. Mushrooms!? Ground mushrooms this time of year!? What’s going on? Yes, to be fair, it’s not your typical find and I was keen to fathom out what on earth they were. Many books out there (even some of the heavyweight ones) do not not include many from the Tubaria group of mushrooms. But luckily, after a lot of cross referencing, I believe I’m dealing with Tubaria hiemalis (Winter Twiglet) – one of the more common species which grows from September to February. And before you ask – No, it’s not edible! Not poisonous, but simply tastes bad. Shame! Well, there you go. You may see some scattered around the country side or near your home even. Key identification info and characteristics can be seen at the end of this post in the ‘Quick ID notes’. These older specimens of the Winter Twiglet grow from late autumn through winter to early spring in woodland debris/mulch. 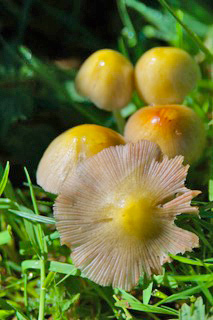 The caps of younger specimens appear more uniformly round, and almost balled shaped, sprouting from the ground, when very young.